Add sugar, chocolate, half and half, corn syrup, 2 tablespoons butter, and a pinch of salt to a medium saucepan over medium heat. Cook until everything is melted together, stirring regularly. Bring mixture to a simmer, cover, and let simmer untouched for three minutes. Remove lid and stir quickly just to make sure it isn't sticking to the bottom of the pan. Attached your candy thermometer and heat the mixture to 235°F, the soft ball stage. Do not stir while it is heating. Once the candy reaches that temperature (about 10 minutes), remove from heat, add the reserved 2 tablespoons of butter, and let sit until the temperature comes down to 130°F, probably another 10 minutes. Using a wooden spoon or sturdy plastic spatula, stir the fudge to incorporate air and further cool it. Add the vanilla as you stir. Continue to stir the fudge until the color shifts from shiny to matte, about 4-5 minutes of stirring. Working quickly, scoop the fudge into a prepared 8x8 baking dish lined with parchment paper. Spread out the fudge for an even layer. Dot the top of the fudge with raspberry jam and run a knife through the jam dots, making swirls. 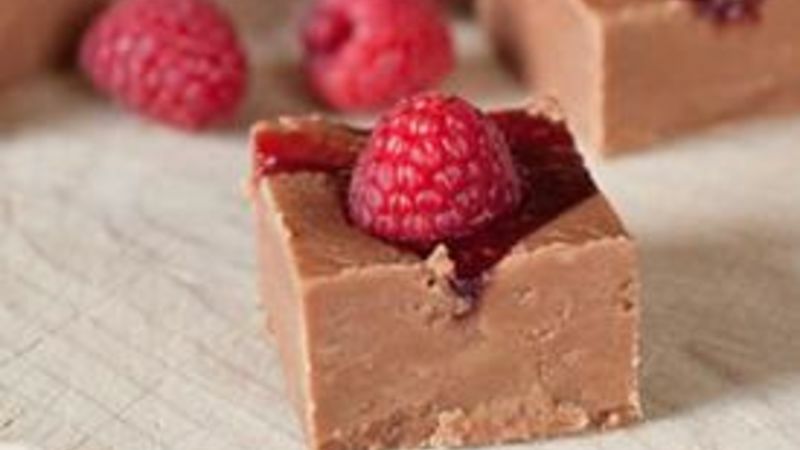 Top the fudge with 16 fresh raspberries in a 4x4 square. You'll use the raspberries for cutting guides so try to make sure they are even. Refrigerate the fudge for a few hours or overnight. Remove the fudge from the pan by lifting out the parchment paper and peeling it away. Slice the fudge into 16 pieces. Serve immediately or store in the fridge for up to a week. The prices that candy shops charge for fudge have always surprised me—a pound of good fudge can set you back $20. The reason it’s so pricy isn’t necessarily because of the ingredients used (although that can be part of it). The reason it’s so expensive: it’s sort of a tricky procedure to heat and cool the candy. But have no fear. If I can learn how to do this, you can also do it. This batch of fudge was only my second batch ever and it turned out beautifully. To change things up a bit, my Raspberry Swirl Fudge has Cascadian Farms Raspberry Jam swirled throughout the chocolate. It’s also dotted with some fresh raspberries for good measure. Starting the fudge is very straightforward. Basically, just throw everything in a medium to large pot. By “everything” I mean the sugar, chocolate, half and half, ½ of the butter, the corn syrup, and a pinch of salt. Over medium heat, stir this until everything is melted well and the mixture starts to simmer slightly. Keep stirring until everything is melted. Now slap the lid on your pot and let it simmer, covered, for three minutes. No more. No less. Then pull off the lid and give the fudge a quick stir just to make sure it isn’t burning on the bottom. Now attach your candy thermometer to the pot and watch it closely. You absolutely need a thermometer to make fudge. There’s no way you can eyeball the temperature. When the temperature hits 235 degrees Fahrenheit take the fudge off the heat, add the other ½ of your butter and let the fudge start to cool down. It’ll take 10-15 minutes to cool to the temperature you want, which is 130 degrees. Once the fudge reaches that temperature, you need to work quickly because if the fudge solidifies in the pan, there’s no way to save it! As you can see, the fudge is still pretty liquid at this temperature, but it will harden quickly. Stir in the vanilla extract and start stirring the fudge with a wooden spoon or sturdy plastic spoon. The goal with stirring the fudge is to slow down the crystals from forming so you have a smooth fudge, not a crunchy fudge. At some point, around four to five minutes of stirring, the fudge will turn from a shiny texture to a matte texture. Now you need to work really fast! This means your fudge is about ready to set up, so go ahead and scoop it into a prepared pan that has been lined with parchment paper. While the fudge is still malleable, add some dots of raspberry jam and use a knife to make some swirls throughout the fudge. Also, dot the fudge with some fresh raspberries. I used exactly 16, which I knew would mean one raspberry per fudge piece. Stick the fudge in the fridge and let it chill for a few hours at least. Then you can chop it up! There are two really great things about this recipe. First, it’s delicious. The sharpness of the raspberries pairs really well with the rich chocolate. Second, and maybe even better, once you get the hang of fudge making, you can skip the expensive candy stores and just make it at home! Nick would like you all to know that he did NOT eat the missing square from the last picture. Somebody did. But definitely NOT him. Be sure to check out his blog, Macheesmo, his book, Cornerstone Cooking, and check out his Tablespoon profile.